Additional Information Rare ref 3603 blue dial with Beta 21 movement and rare detachable 18k Patek bracelet. The Beta 21 is really more an electronic caliber, but be that as it may, the movement features a quartz crystal and interestingly, the natural oscillation rate of the quartz crystal is 8192 Hz, which Patek reduced to 256 Hz by means of a proprietary frequency reducer. Be that as it may, the seconds hand sweeps (versus the usual ticking of quartz movements), and the caliber has 13 jewels. A date is provided at the 6 o’clock position. The case is a joy to behold, and a bona fide 1970s iconic design. 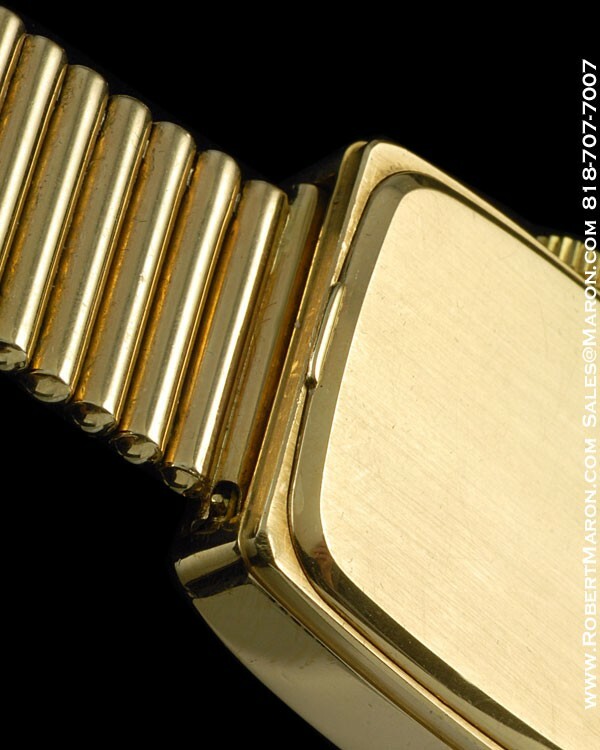 Rectangular in shape, the 18k gold case measures 37.5mm long by 33mm wide by 11.1mm thick. The crystal is sapphire. 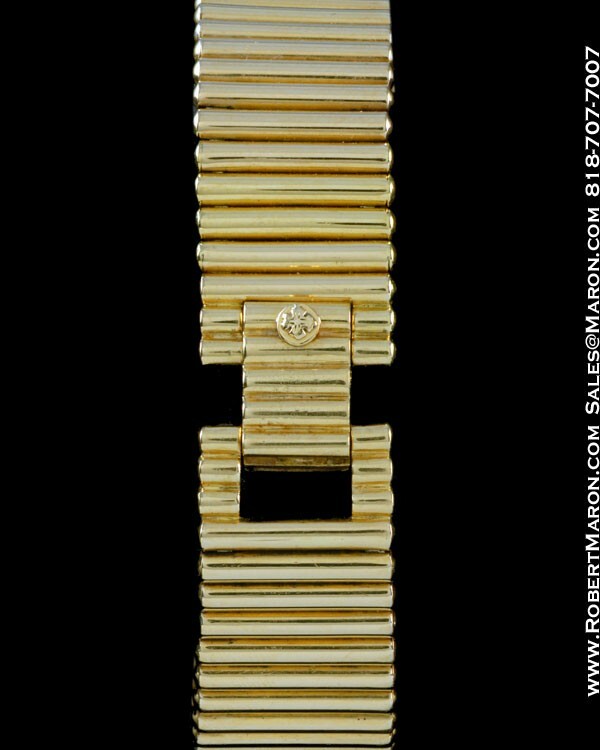 Note that the case design is free of lugs, and the detachable 18k bracelet mounts to springbars inside the case. 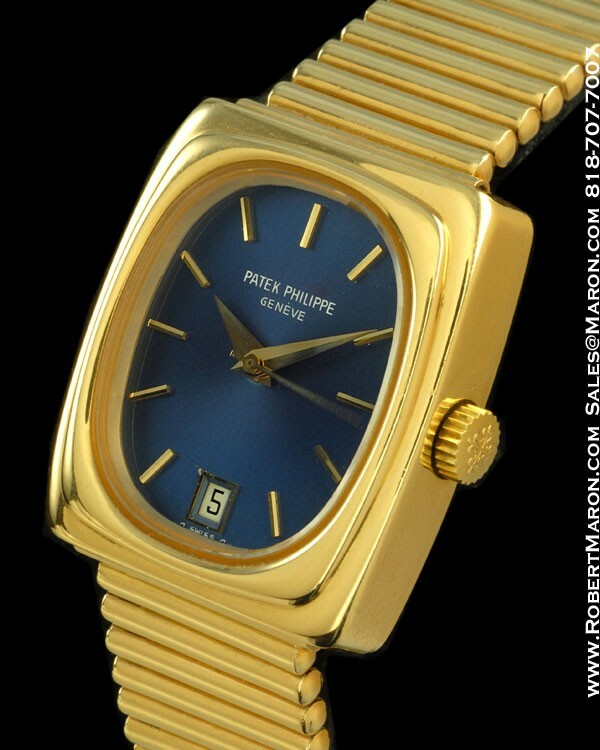 The detachable bracelet version is very rare and the 18k gold bracelet is original Patek, original to the watch, and will fit up to a 7.75 inch wrist. 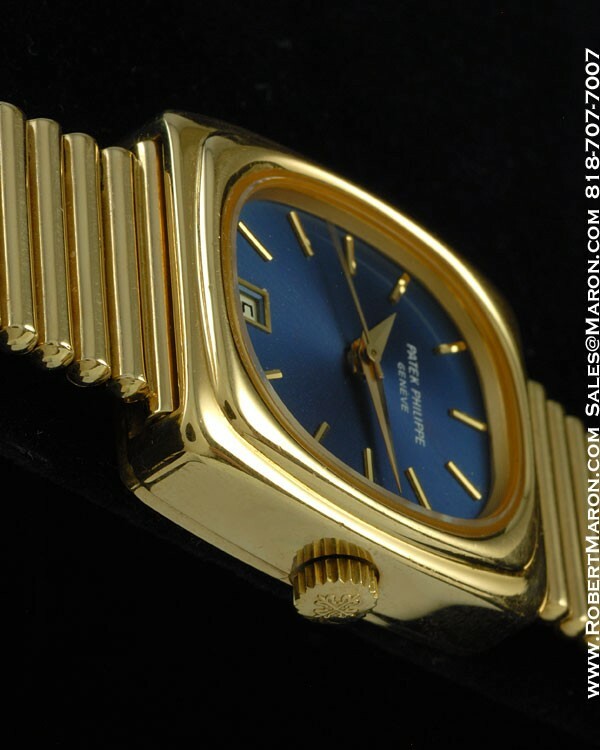 The original, untouched and beautiful blue dial features subtle radial sunburst brushing and applied golden hour markers and date window, which is traced in gold, at 6 o’clock. And ahh, yes, the golden dauphine hands are original and absolutely spectacular. The dial and hands, like the rest of the watch, are in mint+ condition. 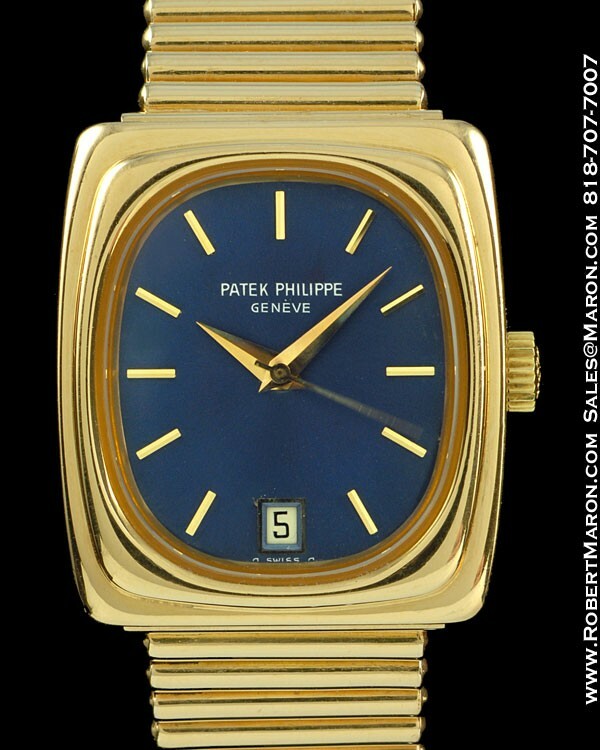 The blue dial is unusual, as the reference 3603 almost exclusively is observed with a champagne color dial. 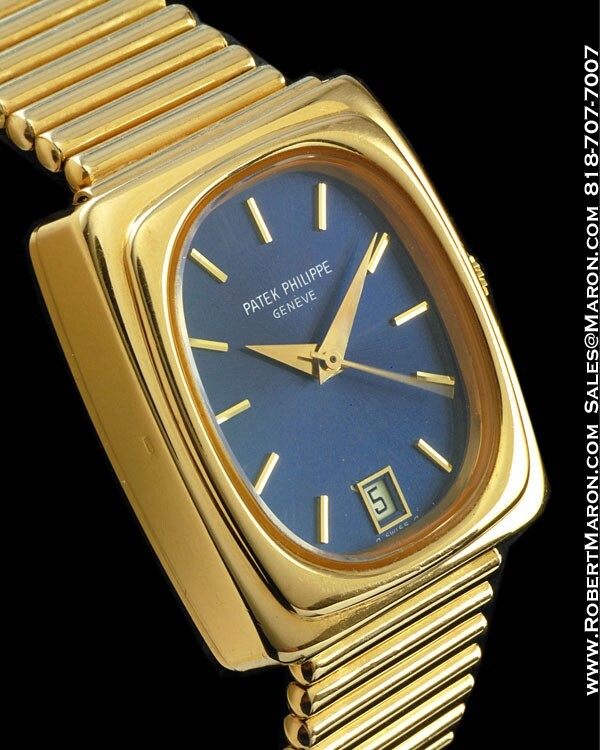 This is a beautiful and very collectable vintage Patek Philippe wristwatch.